Ian Portmanteau, a small time rave promoter, has started a sideline business hacking laundry cards. "I have a device that reprograms laundry cards so that you can get free loads," says Ian. 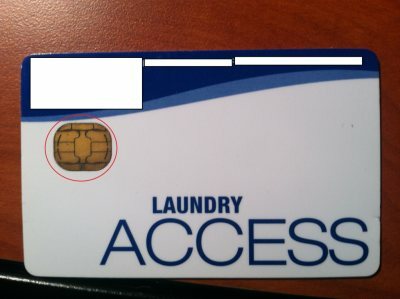 "It works with nearly all card enabled laundry machines. I can fix any card for twenty bucks, guaranteeing ravers fresh undies for life." Last month, the daring entrepreneur set a laundry card hacking booth up at one of his illegal parties. He invited ravers to bring in their cards to be reprogrammed. "I posted a message on a popular web forum, told everyone who was interested that I'd hook them up. I made about $600 that night. Business was good." Ian's laundry card hacking business has so far been limited to the occasional rave, and a smattering of small buildings inside the McGill ghetto. "I'm currently focused on hard partying university students. They tend to piss themselves pretty often, so their laundry budgets are insane. However, that market is starting to dry up, so I plan to expand my reach." The next step, he says, is to hang out in front buildings with laundry card enabled laundromats, asking tenants if they'd like a taste of freedom. "I think I can make solid money if I approach laundry card hacking the way petty drug dealers approach selling crack." Ian doesn't know if his plan will succeed. "It might be a seasonal thing, where I'll have to target new students every year during frosh week. I'm not sure how viable this business is year round. Even if I don't succeed in making a living off of it, it's definitely a nice way to make a few extra thousand dollars a year."